We interrupt your football watching for some Mollie Makes news! 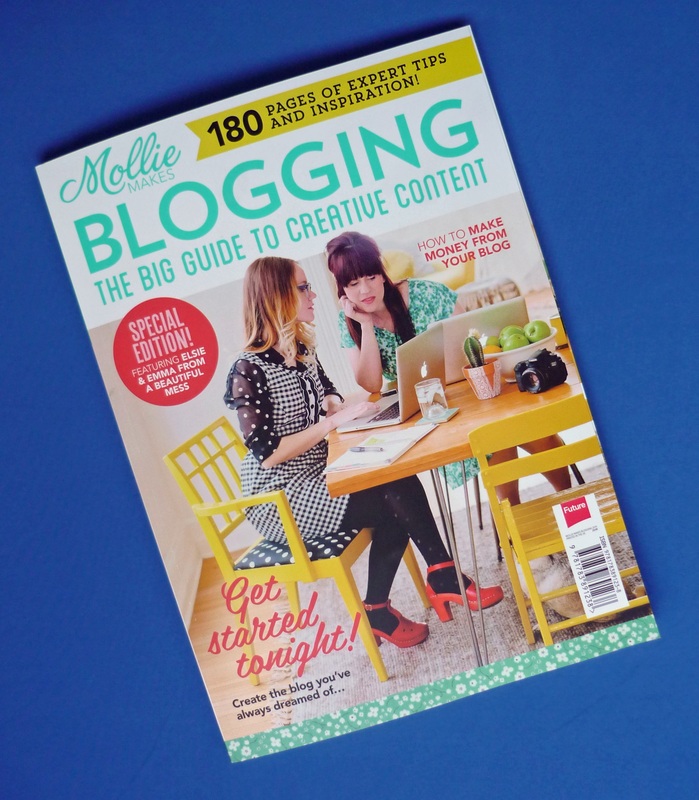 Mollie Makes Blogging is pitched as the magazine to help create the blog you’ve always dreamed of. It’s a 180-page special edition priced at £9.99 and available in most major stores – WH Smith (where I found my copy), Tesco, Asda, etc or coming soon as a e-zine for tablets. Would you like to hear a bit more about what you will get for your money before you go out and buy this hefty tome? I’ve always found the design and style of Mollie Makes impressive; it’s an inspirational and beautiful magazine that speaks to my aesthetic. But I rarely buy a copy as I’ve never truly felt I would leave with something tangible from reading (this is what stops me buying most magazines if I’m honest, but perhaps I’m just a book girl at heart). I have to say, I do love the website (probably as it’s so accessible and just as stylish), and now I am also a fan of this special edition. This one-off ‘zine (don’t you die a little bit inside when you use that abbreviation?) still has a little bit of the fluffy filler material all magazines are guilty of. But it also has a lot of clever, well-pitched and valuable material in here to. “Inspiration” – Themes, Typography and Logos, Favourite Blogs, etc. “Advice” – Tips from A Beautiful Mess, Photo editing, Building Links, etc. “Know-How” – Hosting, Customising, Analytics, Plug-ins, Glossary, etc. Plus a large variety of “Meet the Blogger” interviews (Brittany Watson Jepson, Elsie Larson, Pip Lincolne, Will Taylor and many more) and a number of intense guides in the “Blogging Must-Reads” section (cheat sheets to Facebook, Twitter, Instagram and Pinterest). It’s nice to read about the people who run some of the most successful lifestyle blogs – their schedules, most popular posts, and what they do outside of the blog to earn money, as well as learn a bit more about their personality and back stories. 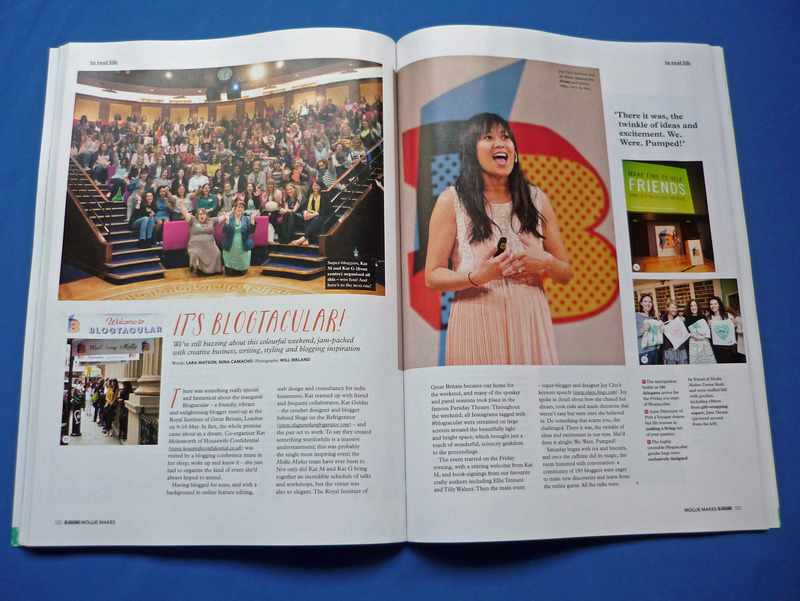 I also really enjoyed the piece on Blogtacular and think I might attend next year! There are a small number of pages dedicated to inspiration for starting a blog, but much more focused on improving your content, post strategy, presentation and marketing. I especially enjoyed the tips on social media marketing and focus on widgets and apps I wasn’t aware of such as buffer and linkwithin. For instance, Pinterest; I could be using this so much more as a blogger and not just as a pinner to interact with other users, promote my sewing projects and drive traffic to my blog. Similarly I’m letting my lifestyle dictate my posting schedule; I share content on Instagram or Twitter when I grab five minutes right before bed or on a Wed lunchtime when I frantically finish a post, aka times where my posts can be easily overlooked. 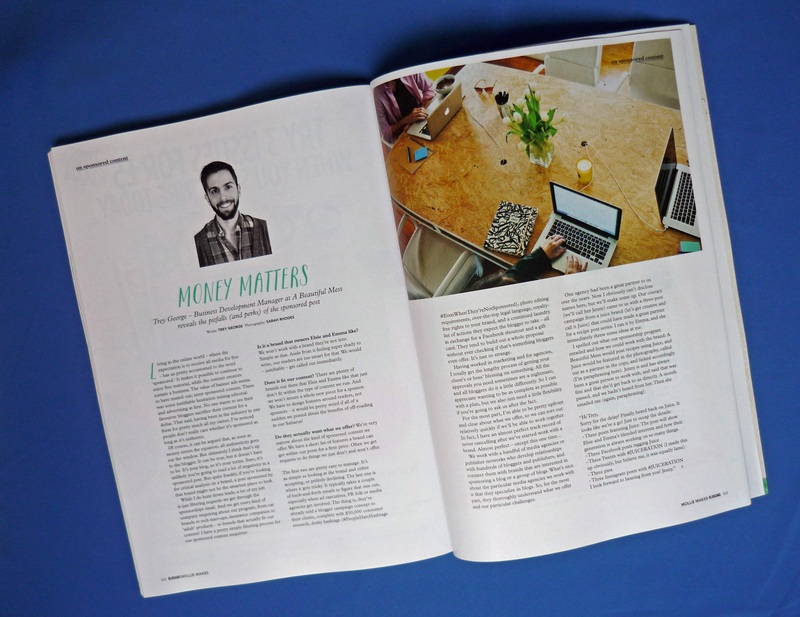 There’s no shame in admitting you want your blog to be successful and there for no shame in buying a magazine to help you on your way. And if a few small tweaks helps increase your stats that’s surely worth the cost of the mag, right? This magazine won’t help you learn much about building a community, teach you about using seo effectively (seriously, I don’t understand how this isn’t featured more) or help you learn css to code your own web design (which I don’t blame it for not tackling). Don’t buy if you’re after any of those things. Now I’m not currently focused on making my blog profitable but I’ll keep this mag on my shelf in case that day comes as there are helpful articles about affiliate advertisement, sponsored posts and tips for diversifying enough to make a career out of your blog. 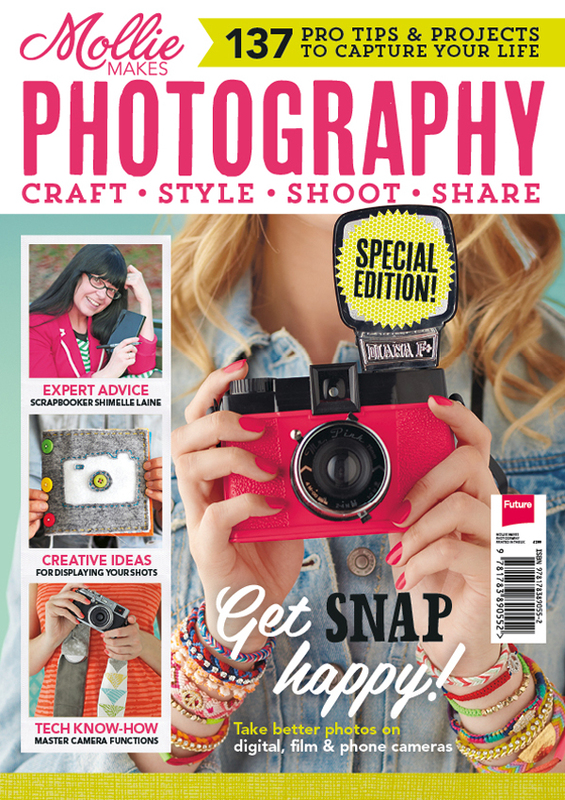 Plus I noticed an ad for a special Mollie Makes Photography which, after reading this well produced special, I will probably go out and get. Now I just need to see if I talk myself into buying the Blog Love 2.0 course. Or talk someone into buying it for me as a Birthday present. Me-Made-May 13 – week 2: its all about the polka dots baby!! We’re in week two and it’s time for my polka dot challenge! I managed six days of me-made dots this week. It would have been seven if I’d conquered my half done Burda dress. Sigh…. Let’s check out the dots!! Self-drafted Elsie knock off dress worn for a stroll around the canal on Bank Hol Monday. Wearable Mathilde muslin (though I’m pretty sure the yoke stitches are going to snap soon because it’s too tight). Prima Tea Dress; never blogged. It has very flattering under-bust gathering and a gored skirt. But I ran out of fabric for the sleeves and it looks silly without them so I always wear a cardigan! Cowering from the rain in one of my earliest makes; self-drafted chiffon top with peter pan collar. I wear this all the time. Its going to fall apart soon. My new morse code crepe Sorbetto (minus the pleat) with contrast bias binding. Not really digging this boxy style but it got some compliments so may keep wearing it. Finally a lovely satin nl 6808. The fabric is from the Birmingham Meet Up so wearing this reminds me of that day. It’s super comfy and flattering and much loved. And that is it for week 2! I’m already worried about week four but we’ll see how it goes. Everyone knows how lame English weather is. Sometimes it feels like we jump straight from Summer to Winter. But something that is different this year is that I’m embracing sewing a Winter wardrobe! I pretended Winter wasn’t happening last year by sewing sundresses but I can’t kid myself much longer. I’ve got some quite ambitious plans. Here are the first few concrete ideas I have. I hope you’re not too cold wherever you are. And if you are I hope you’re whipping up something lovely to keep you warm whether it’s a blanket, a scarf, an outfit or a coat.